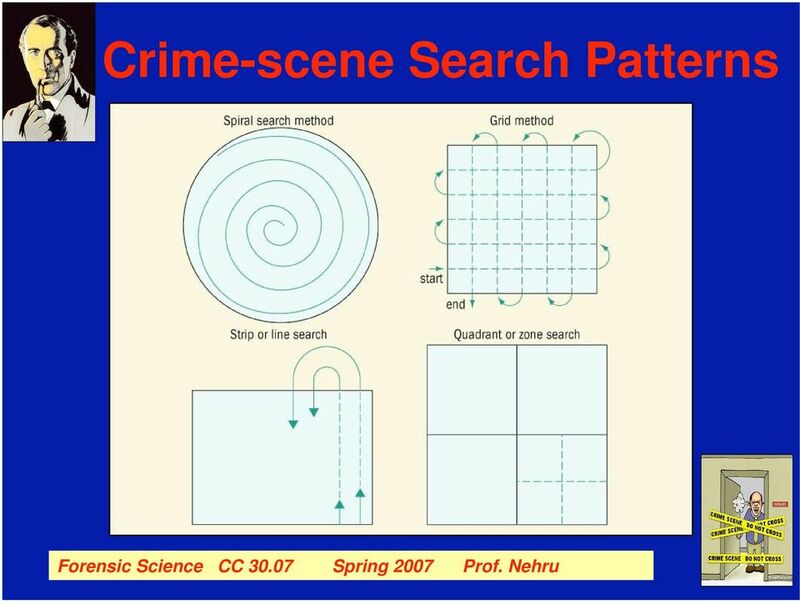 Download "C R I M E S C E N E. Forensic Science CC 30.07 Spring 2007 Prof. Nehru"
2 Physical Evidence Crime laboratories run on physical evidence Physical evidence encompasses any and all objects that can establish that a crime has been committed or can provide a link between a crime and its victim or a crime and its perpetrator. 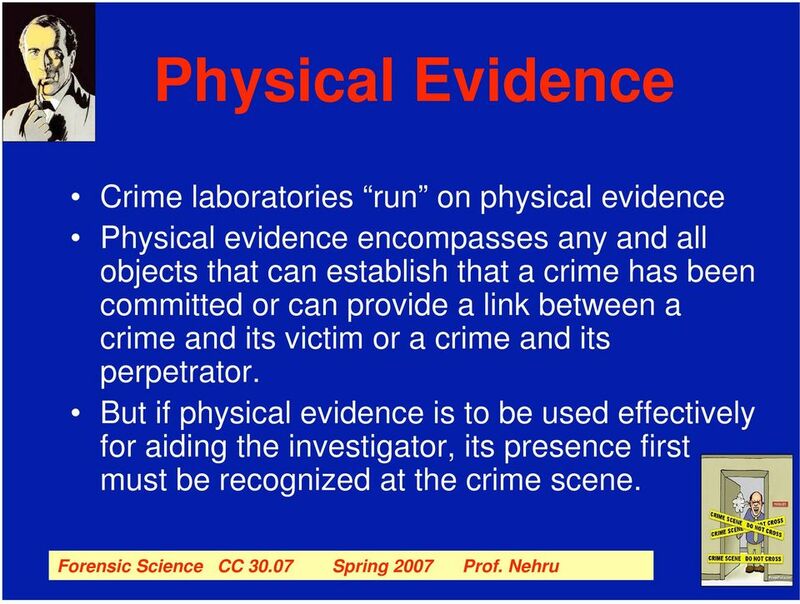 But if physical evidence is to be used effectively for aiding the investigator, its presence first must be recognized at the crime scene. 4 The First Steps -1 The first officer to arrive at the scene is responsible for securing the crime scene. Priorities should: 1. Medical assistance for individuals in need 2. Arresting the perpetrator 3. Exclude all unauthorized personnel from the scene. 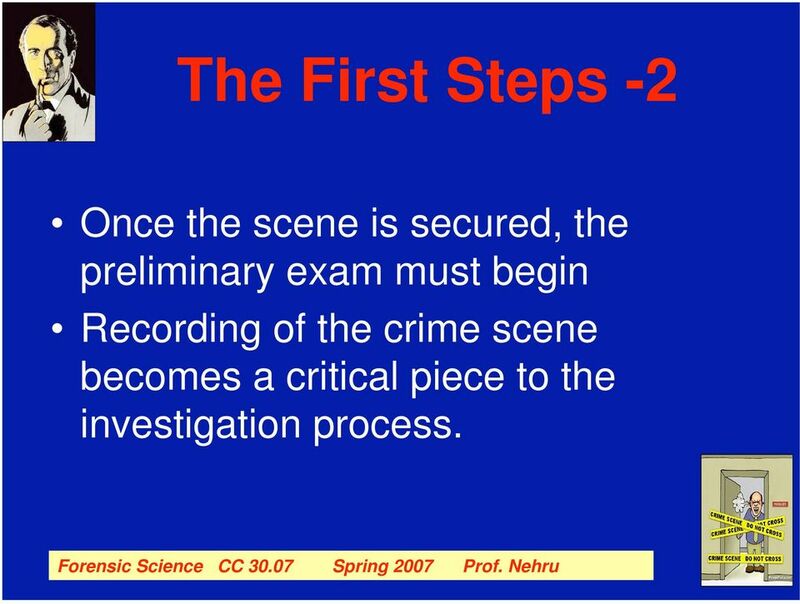 5 The First Steps -2 Once the scene is secured, the preliminary exam must begin Recording of the crime scene becomes a critical piece to the investigation process. 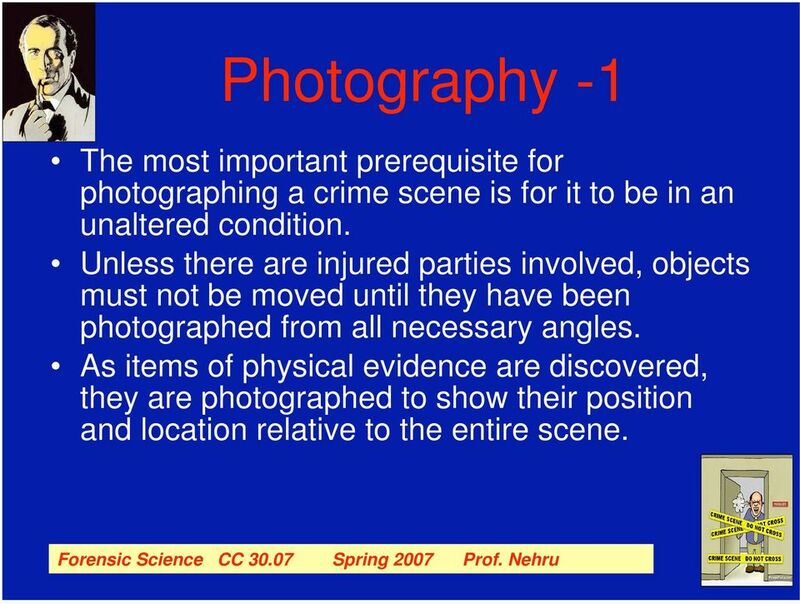 7 Photography -1 The most important prerequisite for photographing a crime scene is for it to be in an unaltered condition. Unless there are injured parties involved, objects must not be moved until they have been photographed from all necessary angles. 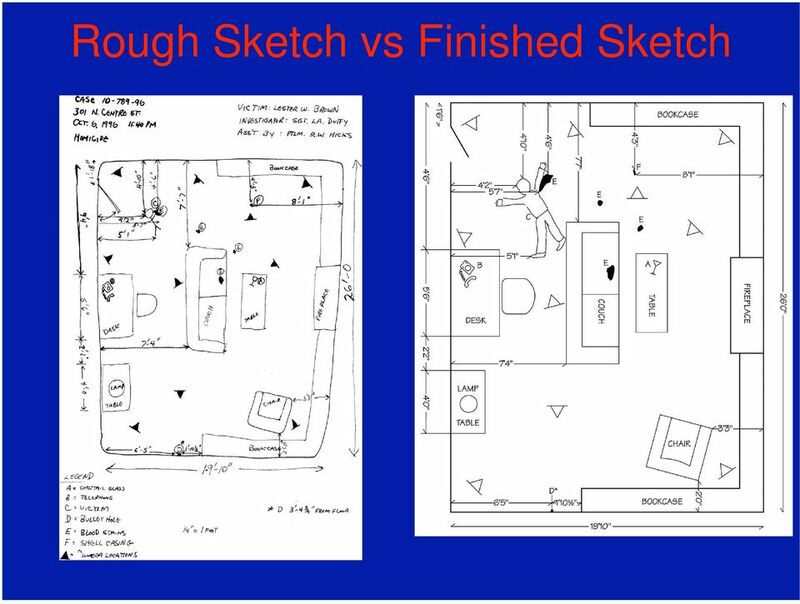 As items of physical evidence are discovered, they are photographed to show their position and location relative to the entire scene. 8 Photography -2 After these overviews are taken, close-ups should be taken to record the details of the object itself. 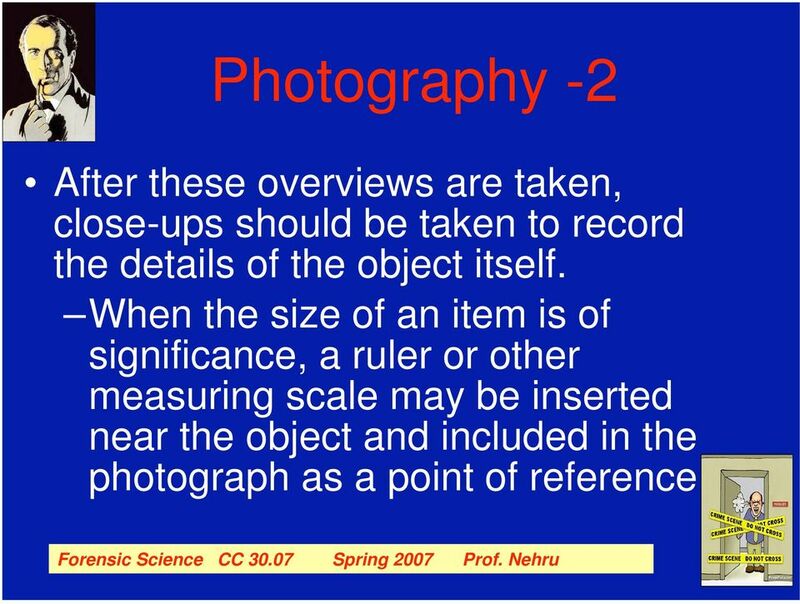 When the size of an item is of significance, a ruler or other measuring scale may be inserted near the object and included in the photograph as a point of reference. 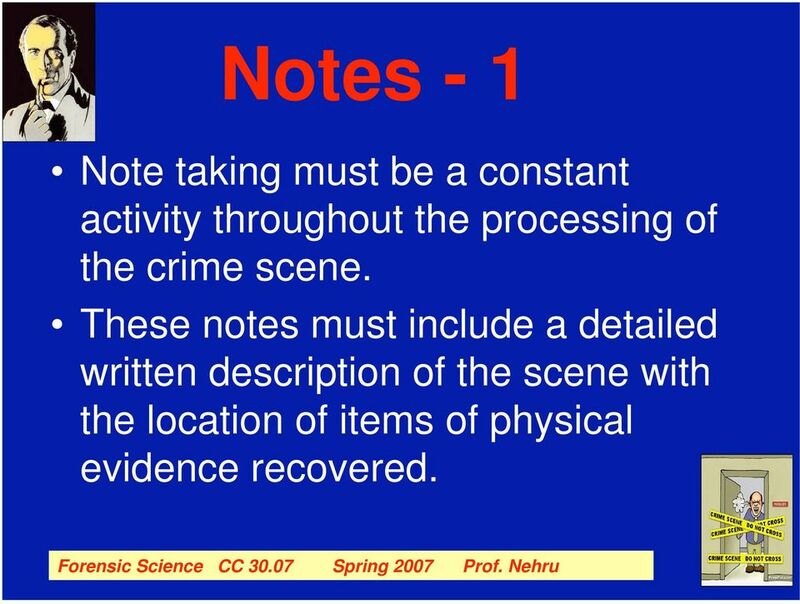 11 Notes - 1 Note taking must be a constant activity throughout the processing of the crime scene. These notes must include a detailed written description of the scene with the location of items of physical evidence recovered. 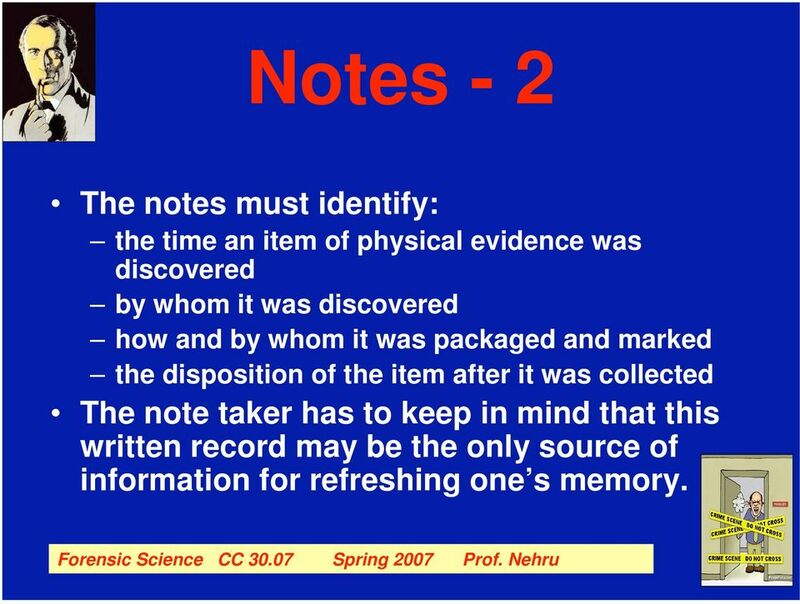 12 Notes - 2 The notes must identify: the time an item of physical evidence was discovered by whom it was discovered how and by whom it was packaged and marked the disposition of the item after it was collected The note taker has to keep in mind that this written record may be the only source of information for refreshing one s memory. 13 Recording The Crime Scene Investigators have only a limited amount of time to work a crime site in its untouched state. The opportunity to permanently record the scene in its original state must not be lost. 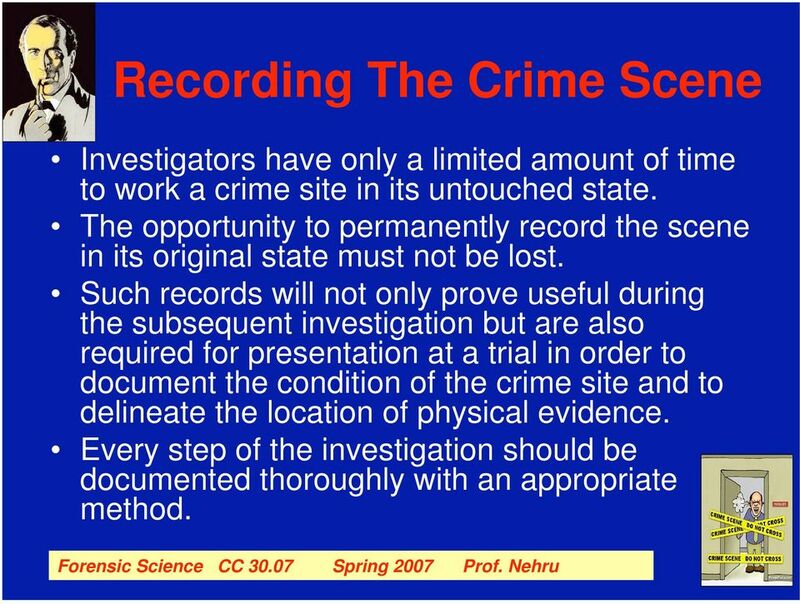 Such records will not only prove useful during the subsequent investigation but are also required for presentation at a trial in order to document the condition of the crime site and to delineate the location of physical evidence. Every step of the investigation should be documented thoroughly with an appropriate method. 14 The Preliminary Exam A lead investigator starts the process of evaluating the area. First, the boundaries of the scene must be determined. Followed by the establishment of the perpetrator s path of entry and exit. 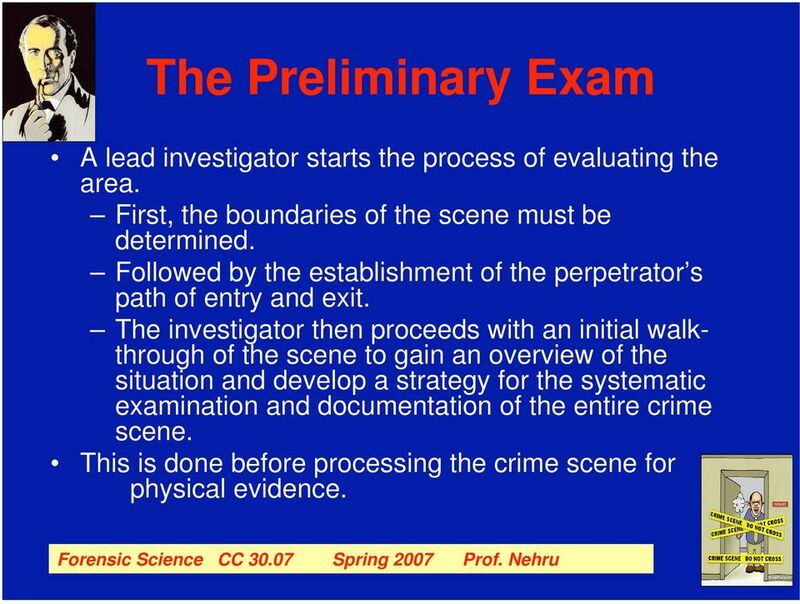 The investigator then proceeds with an initial walkthrough of the scene to gain an overview of the situation and develop a strategy for the systematic examination and documentation of the entire crime scene. This is done before processing the crime scene for physical evidence. 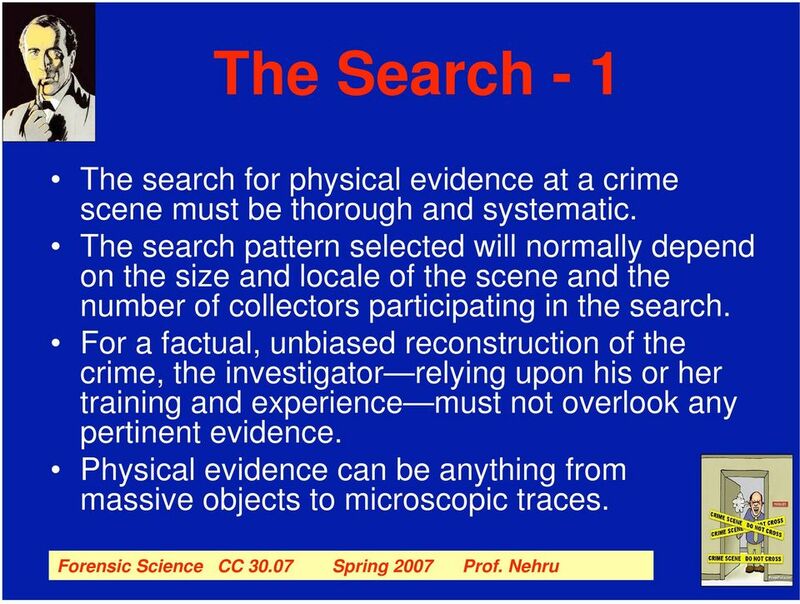 15 The Search - 1 The search for physical evidence at a crime scene must be thorough and systematic. The search pattern selected will normally depend on the size and locale of the scene and the number of collectors participating in the search. For a factual, unbiased reconstruction of the crime, the investigator relying upon his or her training and experience must not overlook any pertinent evidence. Physical evidence can be anything from massive objects to microscopic traces. 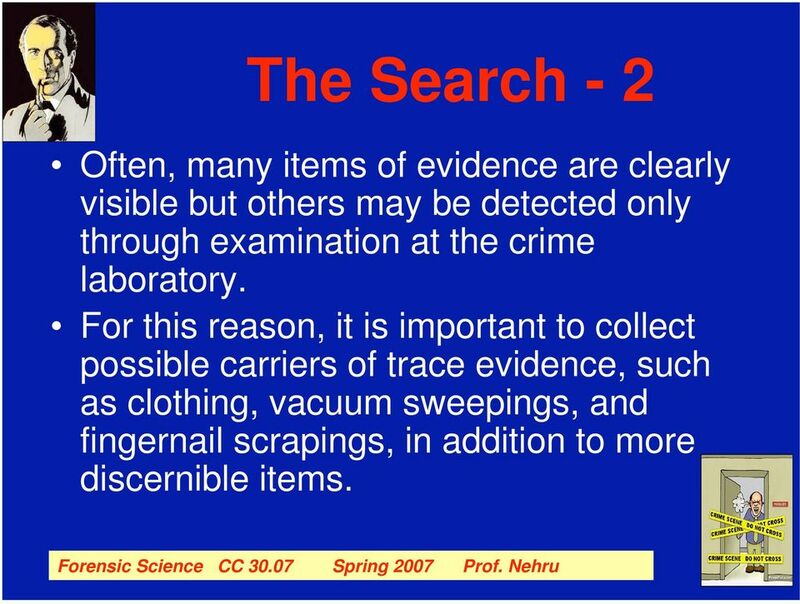 17 The Search - 2 Often, many items of evidence are clearly visible but others may be detected only through examination at the crime laboratory. For this reason, it is important to collect possible carriers of trace evidence, such as clothing, vacuum sweepings, and fingernail scrapings, in addition to more discernible items. 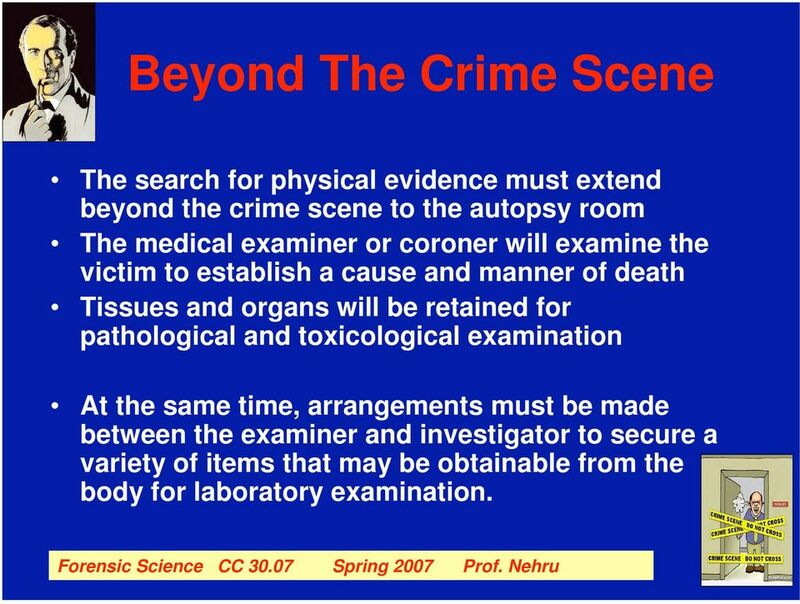 18 Beyond The Crime Scene The search for physical evidence must extend beyond the crime scene to the autopsy room The medical examiner or coroner will examine the victim to establish a cause and manner of death Tissues and organs will be retained for pathological and toxicological examination At the same time, arrangements must be made between the examiner and investigator to secure a variety of items that may be obtainable from the body for laboratory examination. 20 Packaging - 1 Each different item (or similar items) collected at different locations must be placed in separate containers. 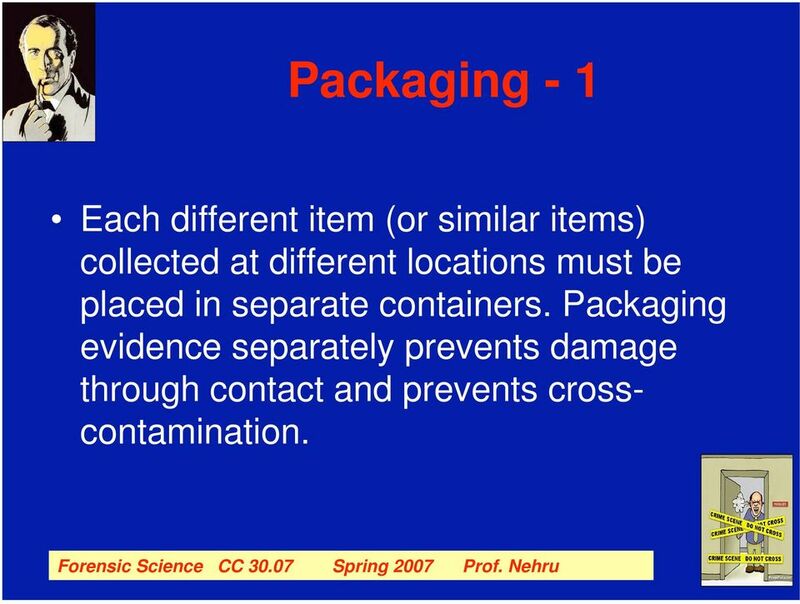 Packaging evidence separately prevents damage through contact and prevents crosscontamination. 22 Packaging - 3 Small amounts of trace evidence can also be conveniently packaged in a carefully folded paper, using what is known as a druggist fold. Although pill bottles, vials, pillboxes, or manila envelopes are good universal containers for most trace evidence, two frequent finds at crime scenes warrant special attention. If bloodstained materials are stored in airtight containers, the accumulation of moisture may encourage the growth of mold, which can destroy the evidential value of blood. In these instances, wrapping paper, manila envelopes, or paper bags are recommended packaging materials. 23 Chain of Custody Chain of Custody A list of all persons who came into possession of an item of evidence. Continuity of possession, or the chain of custody, must be established whenever evidence is presented in court as an exhibit. Adherence to standard procedures in recording the location of evidence, marking it for identification, and properly completing evidence submission forms for laboratory analysis is critical to chain of custody. Every person who handled or examined the evidence and where it is at all times must be accounted for. 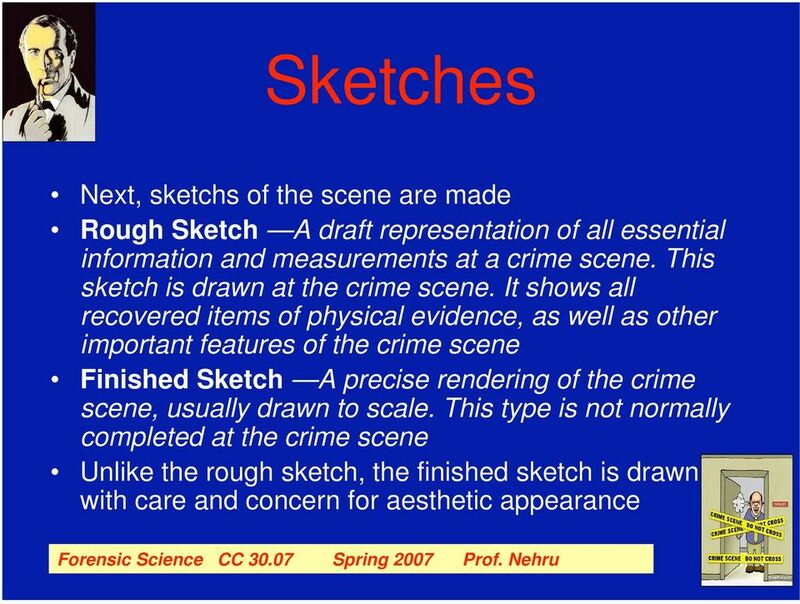 24 Obtaining Reference Samples Standard/Reference Sample Physical evidence whose origin is known, such as blood or hair from a suspect, that can be compared to crime-scene evidence. The examination of evidence, whether it is soil, blood, glass, hair, fibers, and so on, often requires comparison with a known standard/reference sample. 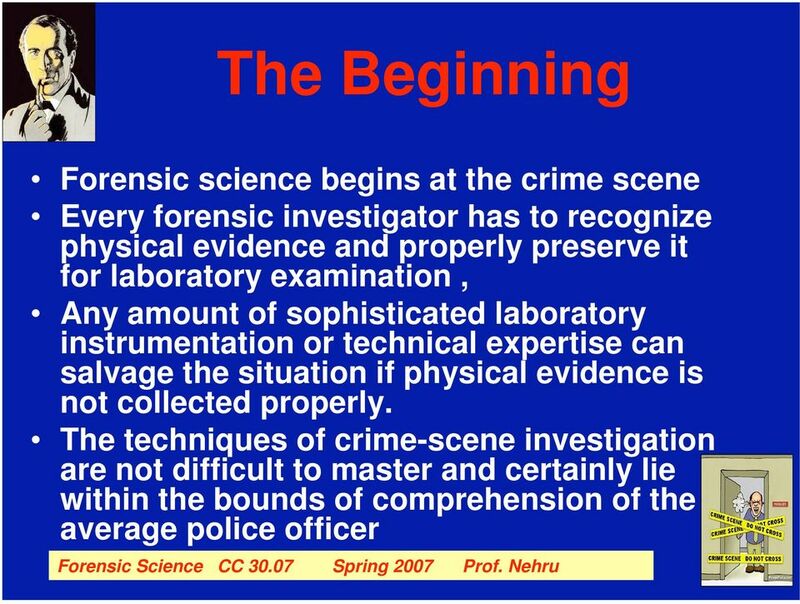 Although most investigators have little difficulty recognizing and collecting relevant crime-scene evidence, few seem aware of the like necessity and importance of providing the crime lab with a thorough sampling of standard/reference materials. 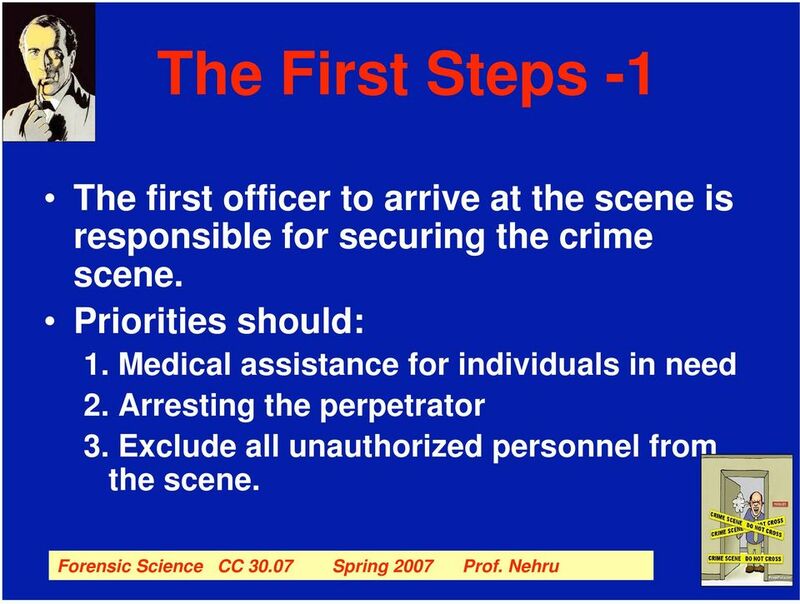 25 Crime Scene Safety The increasing spread of AIDS and hepatitis B has sensitized the law enforcement community to the potential health hazards that can exist at crime scenes. In reality, law enforcement officers have an extremely small chance of contracting AIDS or hepatitis at the crime scene. The International Association for Identification Safety Committee (IAISC) has proposed guidelines to protect investigators at crime scenes containing potentially infectious materials that should be adhered to at all times. THE CRIME SCENE. Physical Evidence. Was a Crime Committed? Crime Object/Suspect Object. Crime Object/Suspect Object. Crime Object. JonBenet Ramsey: Who Did It? JonBenet Ramsey: Who Did It? Patsy and John Ramsey were in the upper crust of Boulder, Colorado, society. In the span of five short years, John had built his computer company into a billion-dollar corporation. A MURDER SCENE EXCEPTION TO THE 4TH AMENDMENT WARRANT REQUIREMENT? Forensics WORKSHEET. 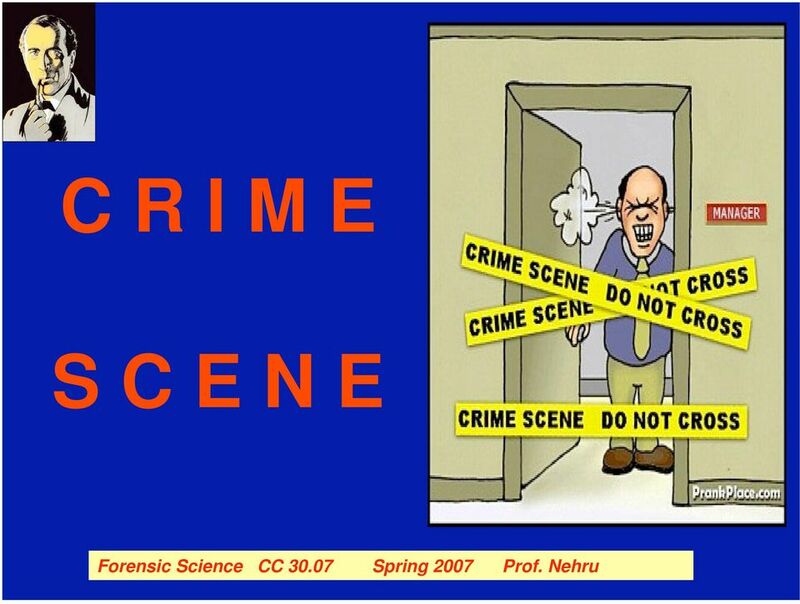 Crime Scene Processing Name: 1. Distinguish between class characteristics arid individual characteristics. Forensics WORKSHEET Crime Scene Processing Name: 1. Distinguish between class characteristics arid individual characteristics. 2. What is a fracture match? 3. 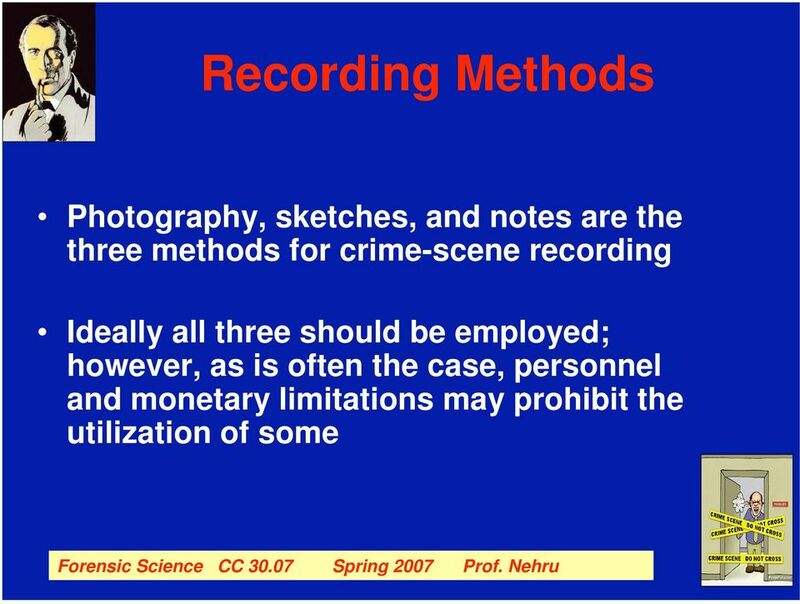 In what ways is a crime scene documented?.